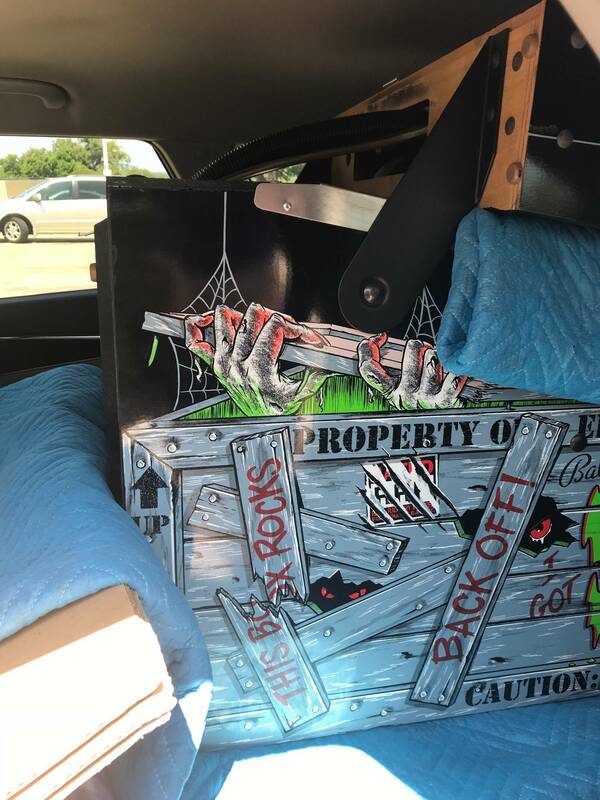 » Forum » All Pinball » Transportation questions » Would Scared Stiff Fit in a 2017 Kia Sorrento? » Would Scared Stiff Fit in a 2017 Kia Sorrento? Would Scared Stiff Fit in a 2017 Kia Sorrento? Hey, everybody. As the title says, I hope to pick up Scared Stiff in a few days. It would be my first machine! Would it fit in the back of a 2017 Kia Sorrento? We would have all of the back seats down. 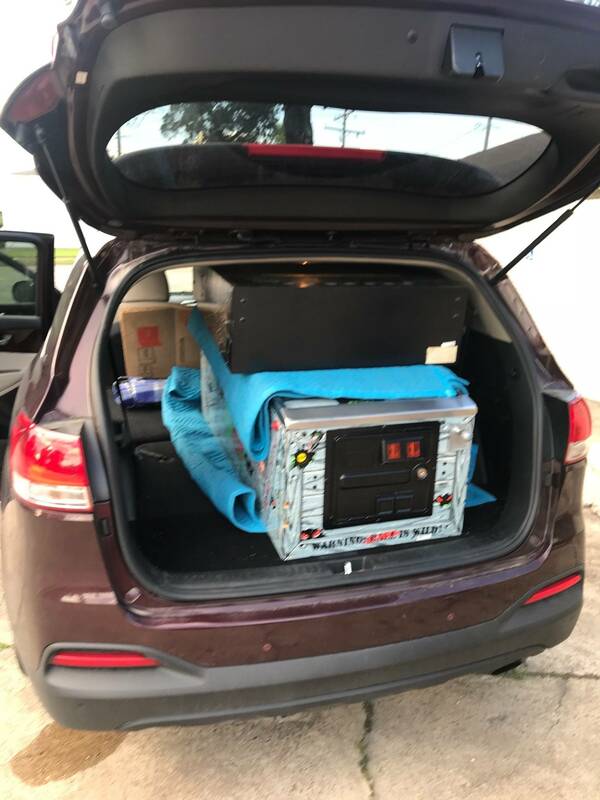 Car and Driver says that cargo volume for the two-row Kia Sorento is 74 cubic feet behind the first row and 39 cubic feet behind the second row. That isn't particularly helpful for seeing if a machine fits in the back. the liftover height is 29.9 inches, however. Has anyone tried to squeeze a machine in the back of a Sorrento? I hope to avoid renting a truck to pick it up. Thanks in advance. Only real way to know is try it out. Otherwise you can measure to see if it would fit. Syco, thanks for your quick reply. We're looking at a 6ish hour drive. My dad and I were going to take the trip together. It would be a bummer to get there only to have to rent a truck and drive home separately. I'll break out the tape measure when I get home. I’m hoping someone who owns this particular vehicle will reply for wavingwilly He’s super excited about his first pin acquisition and nervous about the load up. (I’ve warned wavingwilly that getting your first pin is like getting a pregnant rabbit, more will follow). I have hauled a number of pins in my 2014 Kia Sorento. Ours has the third row of seats, and i have folded both back rows down. MMr, JM, and others have worked great. @markbarclay Thanks! I appreciate your help. I measured our 2011 and one wouldn’t fit. Pretty sure I tried too and failed. Luckily I had a truck. Also confirmed on the pin wiki that it’s a no but it doesn’t give year models. I believe there was a body style change between 2014 and 2017 so worth measuring. You could mock up a pin sized box with cardboard. Remember you can take the head off if you absolutely have to. Your limiting dimension is likely to be the height of the game folded. From the cab bottom to the top of the folded back box is something close to 28 inches. I seem to recall that particular era of Ballys is surprisingly tall. The limiting factor on many vehicles is the height of the cargo area entrance. Plenty of length and width for the machine... just no way to get it inside. I decided to give my son my '06 4-Runner, and did some serious research before I decided on a '16 Highlander as my replacement. As others have noted, "crossovers" are getting a lot less DMD-friendly. And the OP is right, the hatch opening needs to be able to consume a 31"X31" rectangle, or you'll have to remove the head of the DMD. 2016 Toyota Highlander: 79x41x32". Perfect. 2016 Kia Sorento: 74x43x30.75. 1/4" too short? 2016 Mazda CX-9: 62x39x29. Too short. 2016 Nissan Murano: 69x42x28. Too short. Remember you can take the head off if you absolutely have to. Using this "trick" I have transported pins in many European makes of cars (which for American standards, are considered small). Currently I drive a Seat Leon (VW Golf-clone) and it will fit a pin perfectly, with the head next to it, and still about 10-20 centimeters depth to spare. For sure you can apply this trick with a Kia Sorento. I am pretty sure I can make it to fit in a Kia Picanto if necessary . I have a 2016 and sliding the pin on cardboard, the pin just makes it height wise. I used to roll them into my Hyundai Santa fe on a 1" pvc pipe but I had a taller opening. Worst case scenario is you slide the pin in 3/4 of the way, disconnect the hinges from the head and slide the head down on the pins body until you can slide the rest of the pin in. I had to do that with a Sharkey's shootout once. slide the pin in 3/4 of the way, disconnect the hinges from the head and slide the head down on the pins body until you can slide the rest of the pin in. I had to do that with a Sharkey's shootout once. Be very! careful with that. It might cause tension on the connected wires in the head, causing connectors or entire boards to break off. I would not recommend that approach. Be very! careful with that. Yes ideally disconnect the whole head to not put any strain on the connectors. In the case of the sharkeys I picked her up on a ski trip and had ski gear in the car next to the body of the pin. Mine fit into an '02 bugeye WRX wagon so a Sorrento should be no problem. Most certainly with the head off? With this being OPs first pin to ever own I’m sure he won’t want to remove the head. Perhaps he should just ship it via NAVL and save twelve hours of driving? I've got a 2014 Sorento, the model with no third row seating. I had a Scared Stiff in there last year with plenty of room. You'll be fine. The Sorento has never met a game that didn't fit. I've even hauled a Williams/Bally SS and a Gottlieb wedgehead EM in the same trip with the EM cab turned on it's side. You all have been great with these replies. Thank you for all the insight! I am not brave enough to take the head off. I will break out a tape measure and make sure I can make it work as soon as I get home. If the seller is familiar with pins they might just do it for you and show you how if you ask ahead of time. Failing that, people here can easily walk you through it. I've had to take a few heads off to get games down my steps and while it's a bit annoying it only takes a few minutes and is not anything you need technical knowledge for. We can do it lol! If it doesn't fit you could always rent a small uhaul trailer and just tow the pin. I am the GM at Kia of Bedford outside Cleveland Ohio. 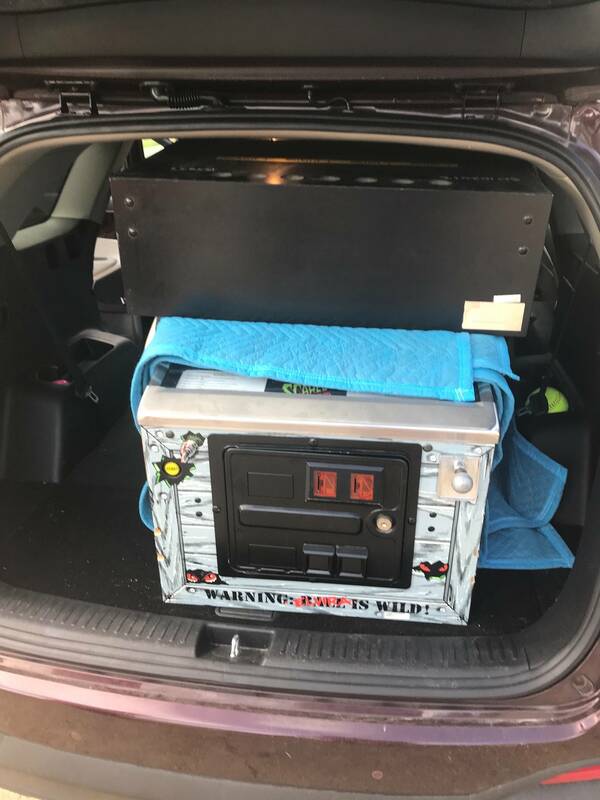 I took a widebody JD Cabinet to work one day because we sponsor the Cleveland Pinball show, and attempted to fit it in every reasonably size Kia we sell. Without taking the head off it fits in a Sedona van. Every other vehicle would require removing the head unfortunately. Thanks, bos98. I will see about renting a truck. 1. The comment made about cardboard is critical. Put it just inside the car, under the machine with the machine resting on it. You can then go around to the side door and pull the cardboard in while someone else pushed in the machine from the back. It'll slide right in without screwing up the seat backs. 2. If your 2nd row is like mine, the seats do not go down totally flat. Not an issue. Make sure you put the machine in coin-door first. The backbox should be at the back of the car at the hatch. Make sure to stuff a blanket or something between the head and your back window so you don't break it if the machine decide to slide backwards. 3. 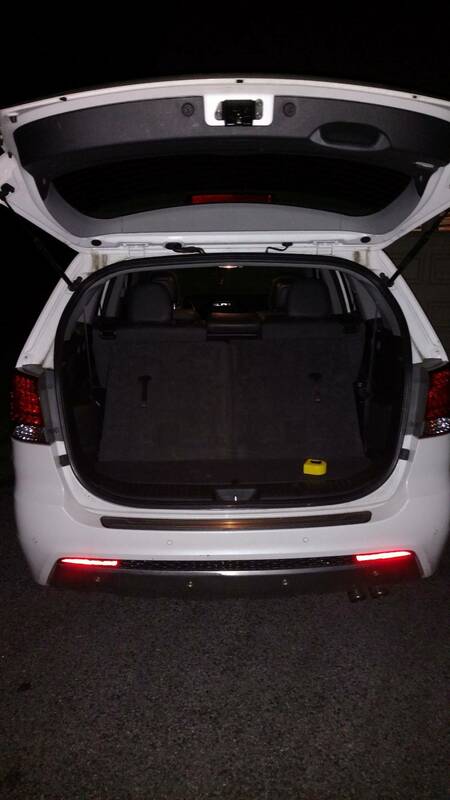 My Kia's hatch opening isn't exactly square. It has rounded edges, so you'll need to take that into account for height. This stuff said, I have to admit that I do not know the dimensions of SS. But if it's the same as the early 90s stuff Bally made (non wide body at least), it'll fit. I'm taking a break from restoring some cast iron skillets at the moment, so I'll go measure mine shortly and will let you know. Selfishly, I'd love to know if you can fit it, because SS is on my someday list. OK. Let's work this problem. Height of machine ( legs removed, backbox folded down: 29"
This means you need probably 29.5' inches of clearance, and this clearance needs to extend about 15" off of center both left and right. Clearance 15" left/right of center: 29.75"
In my Sorento, this would fit. Measure yours the same way, and you'll know for sure. cmack750 Thank you for your incredibly detailed response. Thank you for taking the time to measure this as well! I will be sure to add pictures to the thread with the tight squeeze - we are set to pick up the pin on Friday. Just finished measuring. Hatch space is 6'3" deep, 41" wide, and 31" tall at the back entrance, 34" inside. The cardboard to slide is a nice squeak - I hadn't thought of that. I'll be sure to go coin-door first. Enjoy. Since you haven't moved a pin before, make sure you have something between the head and the cabinet (cardboard, blanket, etc) before you fold it down so you don't ding up the head or dent the side channels for the glass. Make sure the translite/backglass is locked in before you fold the head down so it doesn't fall out (unless you plan to remove it first). And ideally, stretch-wrap 4-5 times around the enter head/cab once your folded it down to keep the head tight to the cabinet while you are driving so it doesn't bounce against the cabinet if you hit any large bumps..... The shocks in those Sorentos are super stiff. I also suggest getting a 2x4 that is the width of your car to set the back of the machine on. easier to get your fingers under that way. I have used that trick for all but 1 game. granted my car has a lip in the trunk which makes this necessary. That works, but probably not in this case, since the hatch entrance is only 31" tall. Best to avoid putting your fingers under it all together. Just make sure the cardboard you put under the machine (should extend beyond the front and sides a little) also extends a little bit by the hatch and just fold it up against the cabinet when you close it. When ready to unload, you can just pull on the cardboard and it'll slide right out. When unloading, I usually slide out about a foot and put the back 2 legs on. Then pull it out more and angle it so you can get the 3rd leg on, while resting on the back 2 legs. Then pull it the rest of the way and have someone support it by the missing leg while you attach that. Then carry it in. Of course, that only works well if you have a walk-in with no stairs, since you won't want the legs on if that's the case. But even still, the cardboard should be all you need to get the cab out of the car. Thanks everyone again for your input. 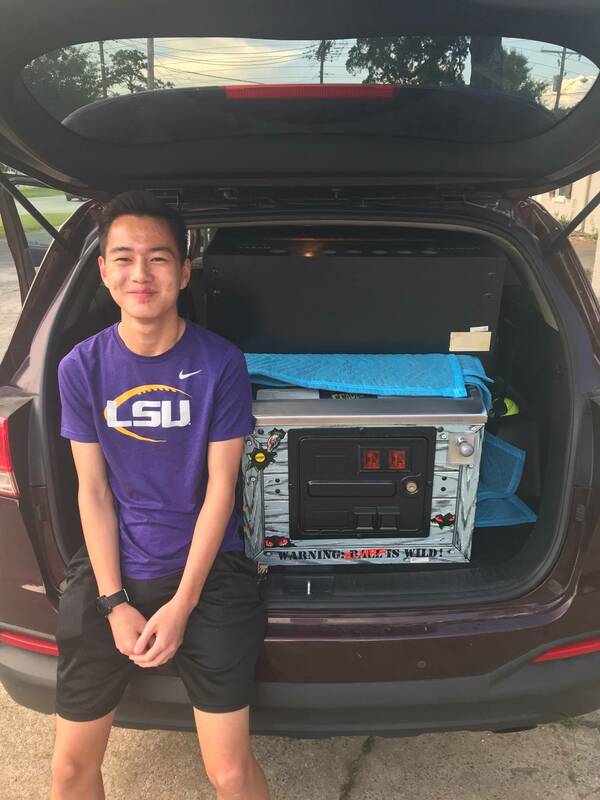 Special thanks to cmack750 for measuring his Kia for me as well! After a 12 hour drive we are home and enjoying Scared Stiff. It fit, but only barely. 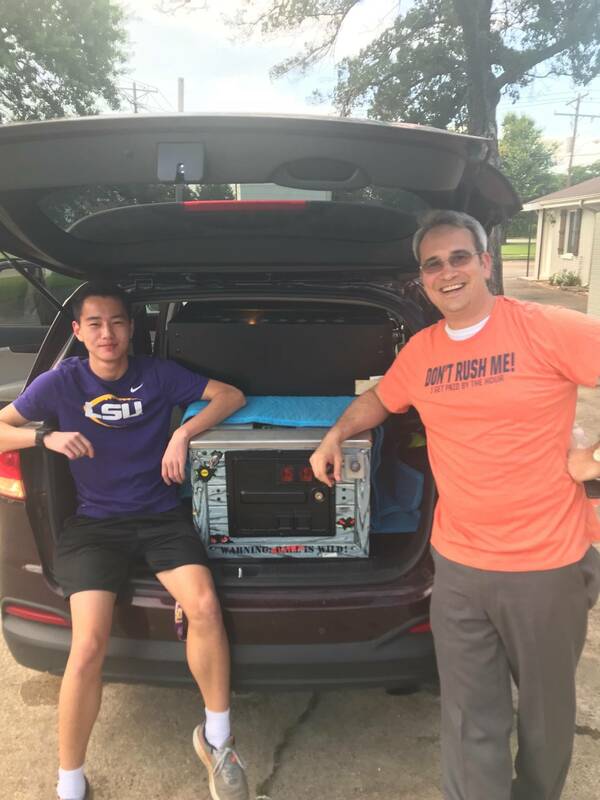 The guy in purple was my trusty Co-pilot and my friend in orange is the one that got me into pinball! Here’s a slightly better picture giving a full view of the fit. I am a Kia master tech and pinball collector. Yes it will. Edit: sorry, found thread too late. Congrats. Fits like a glove. Glad it worked out!